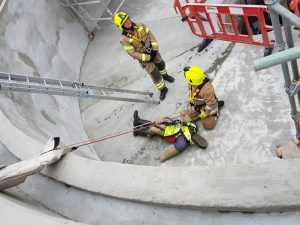 A JOB at a waste water site turned into a training exercise for three local fire crews thanks to AJ Engineering. 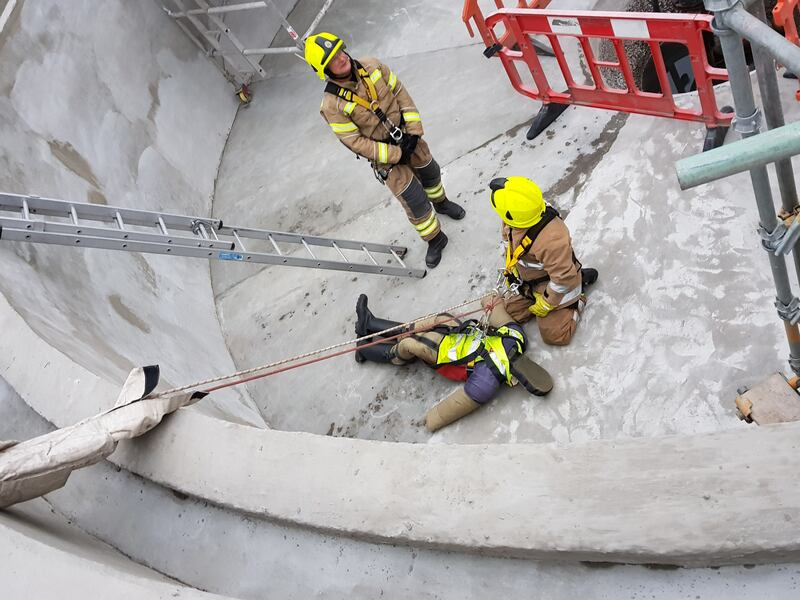 Site supervisor Grant Mitchell invited firefighters from Elgin, Fochabers and Keith to the project at Fochabers Waste Water Treatment Plant to carry out simulated rescue training. Wilson Burnett is managing the project for Efficient Service Delivery (ESD) and Scottish Water. The job is to refurbish a tank which involves carrying out mechanical, steel works and civil works. The project will not be completed until next year as the workers can only get access to one area at a time, but Grant and Wilson who have a team of six at the site saw the benefit in allowing the local fire crews to train. The job at Fochabers is one of three projects on the go with ESD for Scottish Water.